Posted on May 3, 2015 by Lydia / This entry was posted in Monthly Raffle, Upcoming Events and tagged brooklyn, free glass waterpipe, glass on glass, quad perc, raffle, Sunflower Glass Company. Bookmark the permalink. 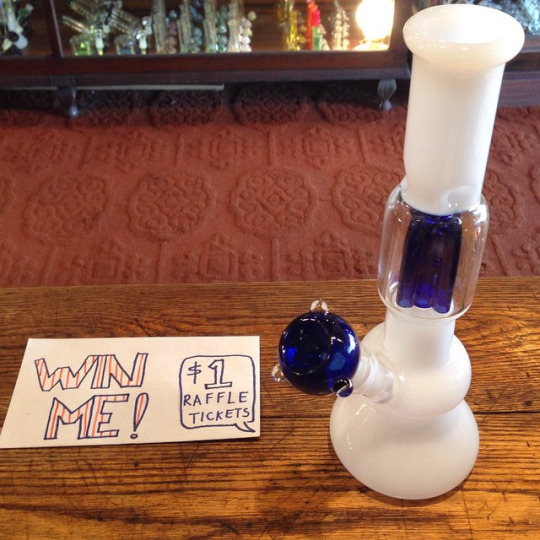 This months raffle is for a beautiful 12″ quad perc waterpipe. This sturdy piece is made of mostly white glass with a clear chamber to see smoke accumulation and royal blue percs and bowl. The downstem is 14mm and the bowl is a 14mm male piece. We sell these in the shop for $125 but you could walk away with this one for one dollar! What have you got to lose? Stop by today and try your luck. We will notify the winner at the end of the month.